Our widest and fastest Power Grader! The remote control, operable from your tow vehicle, lets you raise and lower the 14 grading teeth while you drive. Start high, and lower the tines a bit with each pass. Top-of-the-Line: Extra Wide, Extra Fast! 14 carbide-tipped grading teeth loosen hard-packed dirt and gravel to remove bumps and washboard, and fill in potholes. The rear leveling blade then spreads the loosened material evenly. This is my second DR power grader. Much improved design over the original. However, if you need to add weight don't buy the Weight Strap Kit. You will need to buy two of them for equal weight distribution. Price is a rip-off. Simply go to Home Depot and buy yourself two 16 x 16 x 1 concrete patio blocks and some 48 zip ties. These will work just as well as having to buy two CMU blocks and two of their overpriced 'kits' which should be included with the unit at no additional cost. The product works well. However, I've used it 5 or 6 times and both of cables that lower and raise the unit are broken. I hoped it would last longer than 6 months before needing new parts. Better unit but minor issues. Bought this to replace the older model where the actuator quit working and could not be replaced. Assembly is complicated, mixing inches and metric measurements. No tools are provided so you have to have both sets. On top of that, it calls for a 5mm Allen wrench. The average person does not have a 5mm Allen wrench unless they buy a lot of products made in China and have one laying around. This tool should have been included. The mixing of measurements can be confusing, with the instructions calling for a 3/8" bolt, then asking for a 10mm bolt. Parts should have been bagged for INCHES and another bag for METRIC to make it easier. Instructions are terrible. The figures are in black and white and DR Power makes no color pdf available, and there are no YouTube videos. So part "Tooth bar bracket" looks like a black rectangle. No side profile which shows what it really is like. Very poor image that was used, and without color, you look for a typical black part. Turns out it was orange. I asked for help via their contact form and three days later still have no reply. I figured it out by going through all the instructions and assigning the parts. They need a color installation guide online! The new unit probably will be easier to maintain since the actuator cover protects the battery. That was a major problem with the old unit--exposed battery and wires. The actuator box is easy to remove. Much better design. Operationally there are a few issues. First, the new Tow Bar Hitch is not a good fit for a tractor hitch. The spacing on the tow hitch is too small for a standard tractor bracket. It took several washers to increase the spacing to get it to fit on the tractor. The powered remote is via a cable. I liked the wireless a lot more, but DR says people had problems with the battery. I never did so I guess that's why I like it. The cable will be the one piece you have to really watch to make sure it does not get tangled on the tractor (or ATV), or drag on the ground. It is not that robust or protected at all (other than a simple plastic/rubber shroud). The prongs are welded to the unit, making it more difficult to replace if one breaks. Overall, the new design helps protect the actuator and the battery, which is great. It worked just the same as my previous unit. With the wheels behind the unit, it actually is easier to tow and to back up, requiring no realignment of the wheels like it did on the old unit. Four starts because of the hitch, and the terrible instructions (with no response from DR Power). So, I am a skeptic by Nature. So when I was reading all these reviews, raving about this product, I've always been curious. With this last sale, it was too good to pass up, and give it a try. Oh my gosh! It is everything that everyone has stated before. Could this cut a brand new road through dryland wheat stubble? Maybe... But I know that it definitely can maintain, and rejuvenate, and existing driveway to most anyone's satisfaction. A couple hours of assembly, I'm not the fastest of that, then I put it to work for about 4 hours straight on my 1/2 mile driveway, turn-around. It looks as good, or better, then when the grader operator was finished a few weeks ago. And he did an awesome job! The grader did all the major work, but with this implement I was able to restore it to a condition that looked just a little bit better. Very nice place piece of equipment. Hope it holds up for the long haul... we'll see. So far, so good! We are the last of 5 homes at the end of a private dirt/gravel road. The road is about 1/4 mile long, and our driveway another 700 ft for a total of about 4/10ths of a mile. We moved in last summer - the driveway had a high grass hump in the center - and tended to be muddy and stay wet/puddles too long. The private road was in rough shape - full of pot holes - at least one other resident would bring in some gravel over the summer and fill in the holes. By March, the private road and the driveway were in rough shape - terrible pot holes in the private road, and our driveway was muddy - no gravel to be seen. I was in the process of getting estimates to have asphalt millings or gravel brought in for the driveway- and that wouldn't have helped with the private road. I chanced upon the DR graders - 1/3rd the price of the estimates I'd gotten for our driveway - and I thought I might be able to maintain the road too. I figured it was worth a chance - it was last year's model with the wireless so there was a clearance price and with the DR return guarantee I figured I couldn't go wrong. Wow, what a great machine! It took a number of passes on both the road and driveway (Probably put 5-6 hrs of work into restoring) but it's brought gravel to the surface, filled in holes, removed the grass hump from the center of our driveway. Our private road is smooth and seem professionally maintained - I now spend about 90 minutes a month grading our driveway and the road as maintenance. One bit of advice - have patience - especially if your driveway/road is neglected. It may take 5 or 6 passes to get the results you want. Also, very important - the SLOWER the better. I use a vintage John Deere 214 garden tractor - I run in 2nd gear about 1.75-2 mph the slower speed helps the teeth and back blade to 'dig' better. I put the maximum allowed weight in the weight tray too. Anyway, my wife and I are very pleased with the results - and now we can always maintain our driveway and road to help keep our cars from getting muddy and battering thru pot holes and ruts. I definitely recommend! I pull it with a cub cadet 25 hp. If you take your time and learn to control the grade it give a very nice finish grade. I wish I had bought this 10 years ago. The battery compartment should be redesigned and seal to keep the dirt off it. Our spring thaw this year was the worst I've seen in 30 years. Our driveway got a lot of ruts in it because of all the mud. The DR grader took care of the problem with out any trouble at all. I used one cement block for weight and pulled it with my 20 h.p. garden tractor. It is hard to tell if you need to raise or lower the grader because you have to constantly look behind you. I solved this problem by hitching to the front of my tractor and driving backwards. A little slower but I can move forward and backwards and park on a dime. I am mostly very satisfied with this product. The only complaint I have so far is that I frequently have to disconnect and then reconnect the "plug in" connection before the remote will control the elevation. Minor inconvenience and otherwise the grader performs as promised. It does a great job on my road/driveway. I have only had a short time and used it once but did a nice job. Only thing that needs improving is the hold down for the battery. Ours was broken when received and tried holding down with straps and it didn't work. Would be nice if battery had a cover so not to get so dirty. The grader works just like it should. I am impressed!! The disappointment comes from the very poor design of the battery holder. It lasted less than an hour. It would have been very simple to make one that truly works. Every DR product I have used up to this was made very rugged. This needs to be changed. I will tell you that when I complained your service department was grade A!!!! They bent over backwards to help me. They also went out of their way to show that your company really cares. Have to say, bought it and went on a weekend trip to friends in Ohio to help with deer camp. His drive is almost half a mile long, with huge center jump, lots of weeds, and many stretches with no stone. I tracked 12 miles working it down, my friend said his driveway never looked so good.. His neighbor plus two other friends came and visited and they thought he had all new stone and someone came and graded with Bucket. I'm just mad I did not do a before and after, have after and it looked new with clean edges and stone everywhere and smooth as silk. I was, as was everyone, amazed at the job it did. If you know how to use it it does amazing! I'm telling you, you would have never believed it. My friend Bob said now everyone he drives to his camp he will be calling it Dave's Driveway.. It was incredible say the least! My driveway is 1 km long were it splits off in 2 directions to complete a circle. The main drive was washed out with numerous potholes over a foot deep After about 20 passes up & down over a few days because of rain this 60" worked perfectly. Now the driveway is dry there isn't a flaw anywhere. Just will touch up over the summer to keep it looking new. Couldn't be more pleased with the outcome. Didn't have to add any limestone at all !! I have had my grader for several years. I am about to purchase my 3rd battery. You are supposed to detach battery when not in use, but the battery connection is difficult to deal with (small screws, etc.). There should be a simple plug or something that can be easily detached. As another user stated, when the battery dies, the grader is stuck there. Maybe a simple crank could be added to product. Off to get another new battery so I can get my grader out of the driveway. Response from DR SupportThank you for your thoughtful feedback on the DR® Power Grader. Your suggestions have been passed along to our engineering department. We do appreciate hearing back from our customers and consider carefully all comments & suggestion. Thank you for your business and for choosing DR® Power. very pleased. Works as advertised. I have a 1/4 mile driveway that needs a topcoat. After using the power grader I will wait till spring. Went over the drive 6 times pulled up a lot of good stone and leveled it nicely. The DR Grader is the real deal. I looked for and researched all types of graders for a year prior to purchasing the 60" Driveway Grader w/drag screen. I have to say, I'm very happy with the purchase, it was well worth the money, and the grader does a fabulous job. I haven't had any issues that you see crop up occasionally in these reviews. I have around 20 acres, and lots of driveway. It's simple to set up, simple to use, and frankly it does a fabulous job. The only thing I would recommend to DR is the battery box should be enclosed (I'm fabricating my own enclosure for it) to protect the battery and electrical connections, and keep them clean. Very happy with the purchase and would recommend this product without any reservations. This product seems to be made for really light duty, not in an area where it never rains, driveway is solid and long. The drag screen works better, I'm looking at sending the grader back but keeping the screen. Response from DR Support Thank you for your feedback on the DR® Power Grader. If the area being graded is in really poor condition when you first begin it will take a bit longer. It’s not that the unit is meant for light duty material; simply that it will take more passes (and patience) to go over and over those areas that are in the worst condition. Pot holes take the most time as you will want to travel repeatedly over the area; dragging the loosened dirt back over the hole(s) until eventually they are all filled back in. Once you’ve loosened the area soil up then you can begin to redistribute it across your entire driveway. The Power Grader is a very unique machine that can completely change the landscape of your driveway and save you money at the same time. Once you get control of it all and are able to smooth out and redistribute the soil, it will be very easy to maintain in the future. Please don’t hesitate to call us if you have other questions or concerns about the machine. We appreciate your business and thank you for choosing Dr® Power. We love before and after pictures too! I really like this power grader. It brought my road maintenance from 12 hours to 2. Pulls good. It likes to kick up some small rocks so keep an eye out for those. Especially if you happen to have eyes in the back of your head where the rocks like to go. Held up perfectly to the first use. Hopefully durability will be good. This review is similar to a previous review regarding the implementation of the grader. First the mechanical design and implementation is very good. The grader does a very good job of smoothing, leveling and filling of pot holes. However the implementation of the electrical/electronics is sub par. I am on my third battery. Yes, the battery is disconnected when not in use. An automotive type battery is not the proper battery for the grader A deep cycle marine battery should have been selected. Then after one year the control module became defective. Now the main electrical connector is experiencing intermittent problems. The contacts are not making proper contact. I would give this grader a five star rating if it were not for the electrical/electronic system. I bought the 60" model to maintain a 1/2 mile long driveway that has several hills and curves. I was skeptical at first because I could not find many reviews, the ones I found were mixed. I used it the first time a few days after a rain and it took quite a few passes to work up the embedded rock in my driveway. After that, I hit it just after a rain and it has done wonders for this driveway I have been fighting for several years. Sure, you can use a box scrape or a blade to move the gravel around, but the DR works deeper and creates a great top surface that lasts longer than just scraping it. I do wish I would have ordered mine with the drag screen, it would make a smoother surface. I will be ordering one soon. Even without the screen, the Power Grader is better than anything I have tried before. Well worth the money. Got it, set it up in about 30 mins, charged it for about 36 hours, attached it to a Honda Rubicon 500 4-wheeler and graded my .5 mile gravel driveway that had not been graded in about 3-4 years and was plagued by some ruts and washout. After 3-4 passes in each direction, it looks great and the only downside is that I didn't want to drive on it and leave tire tracks! Great product - works like a charm. Perfect for what I envision using it for. Thanks DR. I HAVE OWNED MY 48" GRADER FOR OVER THREE YEARS. IT DOES AN AMAZING JOB ON MY LONG GRAVEL DRIVEWAY, WHEN EVERYTHING IS WORKING ON THE GRADER. FIRST, MY BATTERY SEEMS TO DIE RELATIVELY FASTER THAN THE ONES I PUT ON MY LAWN MOWERS AND FOUR WHEELER. THEN, THE WIRES TO THE MAIN CONNECTOR WERE BROKEN BY DIRT AND GRAVEL THAT HAD COLLECTED NEAR THE WIRE BUNDLE. THAT HAS HAPPENED ON SEVERAL OCCASIONS, EVEN AFTER PULLING THE WIRES TOGETHER WITH A ZIP TIE. I HAVE CALLED FOR ASSISTANCE AND HAD A NEW CONNECTOR WITH WIRES ATTACHED SENT TO ME. AFTER INSTALLING, ALL I GET IS A CLICKING NOISE WHEN I TRY TO RAISE OR LOWER THE TEETH. I ALSO HAD ONE OF THE WHEELS CRACK WHERE IT WAS BOLTED TO THE GRADER. IT HAD TO BE REPLACED AT MY EXPENSE. IF THE ELECTRICAL ISSUES COULD BE ELIMINATED, THE GRADER WOULD BE OUTSTANDING. AGAIN, THE GRADER PERFORMS BETTER THAN OUTSTANDING WITH REGARD TO THE ACTUAL GRADING AND FIXING DIRT AND GRAVEL DRIVEWAY WITH HOLES EVERYWHERE. NOW I WILL NEED TO TAKE IT TO THE LOCAL REPAIR SHOP AND SEE IF THEY CAN FIGURE OUT HOW TO GET IT TO WORK. IT WILL PROBABLY NEED A NEW BATTERY, AGAIN. IT HAS BEEN OVER A YEAR SINCE I BOUGHT THE LAST ONE. Best tool I have ever bought. The DR Power Grader is one of the best things I have ever bought. It is very easy to use and does a great job. My driveway and road are looking great, especially when using it with the drag mat. Very glad I bought it. The 60" grader is working fine and as expected. High quality product Except... see below. I originally paid extra for shipping because of the weight of the machine and where I live. I did not get request filled (I was expecting a lift van or truck with a lift gate). Instead a semi-truck with large trailer showed and could not drive in (which is why I wanted a lift van). I'm not blaming DR for this but the shipping company for possibly misrepresenting DR with their claim of multiple shipping categories. Next item , I went to apply grease to one of the grease port on the wheels and found my grease port damaged. The wheel is ok (that I could tell) but grease port is damage beyond repair. I will be requesting a replacement grease port from DR. Response from DR SupportThanks for your feedback on your new DR® Power Grader. We apologize that the delivery proved less than satisfactory. We do see within your customer/order file that you certainly did request and pay for lift-gate service and that our Customer Service Department has since refunded your account for not having received that service. We work closely with our carriers to ensure the best service possible and will pass your comments along. The grease zerk has shipped and hopefully you’ve received it by now. Please don’t hesitate to contact our Tech Support Department should you have any further questions or concerns. We again apologize for the bumpy start and certainly do appreciate that you chose DR® Power and want to thank you for your business! When you lower grader to grade the wheels and tires bounce off the ground. Just a short time before this creates issue or damage to both. With that said this grader does an excellent job on my driveway of 1800 feet. I just hope it holds up and if it will I will write a different review at that time. Response from DR SupportThank you for your feedback on the DR® Power Grader. We are going to have someone from our Tech Support Department give you a call. It doesn’t appear as though we’ve ever spoken to you about your concerns and so we feel confident that we can offer some helpful operational tips. Please don’t hesitate to call us anytime should you have any other questions. Our Tech Staff are always happy to assist you. Thanks for choosing DR® Power and we will be in touch soon! Picked up grader today, put it together, & an hour and a half later my 1,000 ft. driveway with many 6"-8" deep holes is nice and smooth! Pulled it with my farmall H which is overkill, but worked nice. Definitely worth it. The power grader was delivered ahead of the stated date. The equipment was well packed and easily assembled. The equipment is well made, sturdy, and high quality. I highly recommend this piece of equipment. I went and picked iup my grader took it home and put it together. The first time I used it, my yard looked better then it has in years. Thank you for a useful well built product. I just got to use the grader this weekend and it works good for what I need it for. It's definitely going to take me some time to get things back to normal but once I do it should be easy to keep it that way. This item works great. Even in the hard limestone of my quarter-mile driveway it seems to dig in fairly well. The teeth are strong and I am satisfied. Two upgrades I would recommend, first make the yoke stronger I have already bent the A-frame yoke but DR replaced it under warranty, thank you . Second, I would make a full enclosure for the battery and wires. It just gets covered with dirt mud soil rocks everything you're going through. The battery compartment should be completely enclosed. I plan on working this piece of equipment card, I hope it is up for the task. Great buy solved my driveway problems! I have only used it once but put it to the test right away. It is a work horse and did a very good job on my driveway. I had about 2 inches of sodium chloride over my gravel and it pull up the gravel very well the first time around. After receiving the 60" power grader in mid-January I've done nothing but, wait on replacement parts after only one use. The initial battery was bad to begin with and would not take a charge, now the plastic housing supporting the upper actuator has broken off. I've now noticed that the oversize rock pan has also split. It appears that all I do is wait on parts. Still Waiting! Response from DR SupportThank you for the feedback on the DR® Power Grader. We apologize that your experience to date has not gone well. Someone from our Tech Support Department will be calling you today. The replacement parts have shipped out and we certainly want to assist you with these concerns. Your business is important to us and we appreciate that you chose DR Power Equipment! Response from DR SupportThank you for your feedback on the DR Power Grader. We are going to have someone from our Tech Support Department give you a call - we certainly want to make sure your machine is in good working order. If you ever have any concerns and or questions, please don't hesitate to call us at -800-376-9637. Your satisfaction is important to us. You will hear from us soon and thank you for your business and for choosing DR Power Equipment! lightweight but adequate, I would hate to put it behind a tractor my 4 wheeler is large enough. About the greatest tool I have ever used. Would recommend to everyone. After only 2 hours my grader quit raising and lowering. Since they do not have people in customer service on the weekend, I had to wait until Monday. Then I am informed that I should do some tests with stuff I do not have. Finally they sent me a new battery, transmitter, and board. It works now but it is raining so much I can't try it out to see how long it will work. I also saw reviews about the cheep plastic pan for extra weight. So I used 50 ponds of chain so there was evenly distributed weight with NO sharp edges. My pan split down the middle. Over all I am not very happy about this purchase. Response from DR SupportThank you for the feedback on the DR Power Grader. We apologize that you've had difficulty with the machine and hope that our assistance has been helpful. Someone from our Tech Support Department will be calling you in the next day or so to be sure. We appreciate your business! The castor bracket broke, I had to wait about a week before the part came, I have used it once and it seems to be working as advertised. I really like it! The DrPowerGrader work great for what I wanted it for but I didn't like the front wheels I couldn't keep them straight they wanted to stay sideways while I was pulling it. I really like it thank you. This unit has been purchased for a Home Owners Association use for 3 1/2 miles of gravel over shale roads. I have used my personal 48" grader for several years and it has been a great product. We decided on the bigger model and the upgrades are noticeable, i.e. non adjustable teeth, and braced front axle. I recommend it to everyone. Works excellent as I expected. your advertising told me an atv could pull this unit. not true , an atv will pull it but your atv must have 4-wheele drive . the plastic tray which holds rocks for added weight is too fragile to hold rocks. I sure would like to have an invoice and warranty paperwork. this would be the third time I've asked .I haven't used it much because of the atv issue, I will let you know when I get a unit that will pull this grader . Response from DR SupportWe're sorry that you have had these issues! While each situation the Power Grader is used in is unique, the use of 4 wheel drive isn't a mandatory requirement. It is beneficial especially if you have a steep incline though. Perhaps you are taking a little too deep of a bite on each pass? Try taking a little less and that may solve the traction issue? The Tool Tray has a carry capacity of 70lbs. It is for carrying extra weight when needed to help the teeth break through hard packed material. Although carrying larger rocks that get dug up seems like a logical option, the sharp edges can cause breakage to the tray from bouncing around. We have sent a copy of the invoice through email on 6/30/14 and will send another as well as regular mail. Maybe your spam filter caught it? We will contact you to follow up on this. I have a approx. 1400' long driveway. It has never been kept up in more than 20 years. I bought the bigger 60" Power Grader. It was so easy to use and I feel it did a Great Job! Keep in mind the worse your driveway is the more time it will take to make it nice. I ran this Power Grader over my driveway about four complete passes and I was amazed. My neighbor came over and he also was impressed. It already started getting rid of the grass hump in the middle and was popping out rock you don't even know they were there. Anyways it did a Great Job! Keep in mind that the harder the ground is you will have to make lots of passes. Also if the grass hump in the middle is to thick, you will need to manual take it down. This is not designed to remove real thick weeds or grass. But once you get your driveway back to where it looks real nice. This will help keep it that way with ease! Satisfied Customer! Pays for it's self every time I use it!!! Sorry this is long overdue, I purchased the 60" model a couple years ago and was really skeptical from just viewing the ads! I have about a quarter mile driveway in the mountains of Idaho that some people would call a goat trail at best! We get from 2 to 4 feet of snow each year, and due to the steepness of our driveway, the spring run off makes ruts that sometimes get 10 to 12" deep. I should have taken before and after pictures this year to show, but I didn't! It takes on and average about 2 hours of work with the road grader and my atv, and you could drive your Lexus up there if you wanted! Before I purchased the road grader, I spent about $1500. a year to have someone bring in a cat to smooth it out, that's why I say that it pays for it's self every time I use it!! Definitely a 5 star Review from me!!! Response from DR SupportWe're sorry you have had these issues, thanks for posting a review though! Although the battery is new, it should be placed on a charger to make sure it is fully charged. It should also be charged after each use & every 1-2 months when not in use to maintain the charge. Hopefully the replacement wheel is holding up better. We will give you a call to check in with you. The 60" grader works great on my drive. Bust hard pack loose and spreads evenly. You may have to make several runs, but then again your not pulling a piece of heavy equipment. We have a small riding arena that the drag works well on.. It remains to be seen how it works on my driveway cause we are pretty rocky. Right now it does every thing we want and does it well. When I picked up the grader at the trucking depot, the box with the loose parts in it had been ruptured by a forklift fork and had a gaping hole in it. Fortunately only one bolt was missing and I was able to purchase a replacement at a local hardware store. The box that was ruptured was loose inside of the crate and was hanging down into the fork path which may have been why it was punctured. The product is rather light weight but operates well. I wish it was heavier and a little wider. It needs to be longer so it won't go down in the holes but instead dropping dirt in the holes. Front tires need to be in front of the rippers. Grease zerks are a weird size so my gun won't work on them. Raising and lowering is to slow. Plastic rock box broke in just a few hours. It will not rip hard normal dirt even with weight. In soft material without holes the same size as the machine or larger it did a fine job. It is strong and held up under severe conditions but I had to hire a motor grader to do the job and get rid of the holes and dips. This machine is for small holes and dips with soft material. Any weeds or grass the rippers will plug up in a mater of seconds. If they had a kit to make it longer it would have worked for me. Being short it went in and out of the holes without dropping hardly any dirt in the holes. A product that delivers what it promises. The 60" power grader arrived and was off-loaded into our lawn trailer since we could not accept delivery at our property. Assembly was relatively easy and we hooked it to the back of our older Kawasaki Mule and began maintaining our driveways. I had purchased it on recommendation from a friend and I've since recommended it to another person. Good to know that DR products measure up to their hype. I used the grader on my gravel driveway which is approximately 3700" long. On areas with finer material the grader did a pretty good job. Where the material was a little courser (1" to 2"), I had to make a lot of passes to get marginal results. Response from DR SupportThanks for leaving a review about your Power Grader. It may take several passes depending on the material makeup of the driveway. Adding weight to the tray can help it to dig deeper. Thanks again for leaving a review. We will pass your comments to our Product Development department for review. The power grader works as advertised. We have a long gravel driveway. For 25 years I have been maintaining with a tractor and blade. The DR Power Grader has simplified the task of maintenaining a smooth driveway. It packs much better and stays smooth longer after grading. Our driveway is over a quarter of a mile long and full of pot holes, in desperate need of grading and repair. I got a quotes for the repairs, ranging from $4,200 to well over $5,000. I saw an ad on TV for the DR Grader and thought, what the heck, nothing ventured, nothing gained. I can't believe just how easy this implement is to use, how great it works and what a beautiful job it did. I can't wait to use it on other projects around the farm. I am extremely satisfied with the performance of the Grader and more than exteremly satisfied with the money I saved!!!$$$!!! The DR60 grader does what it is supposed to do and I am very pleased with it. I would recommend it to anyone. Works good on gravel and dirt. The product works as advertised. Just a couple of little comments: An off/ on switch to disconnect the battery would be a nice feature so that you don't have to remember to pull the connector. The other thing that I noticed when grading a road with a crown in it, the screen tends to slide down to one side or the other to follow the slope of the crown. Perhaps having the screen slightly wider than the grader would help to solve that problem by providing some overlap. Service outstanding! Performance does what you say it will. I bought a DR60 Power Grader and cover. We have 1/2 mile gravel drive and the grader does a good job of filling holes and smoothing the drive out. It is also being used in landscaping our horse lots and is doing an excellent job. We had a problem when we received the grader and you worked with us until the problem was corrected. Your people were very pleasant and knowledgeable and did their very best to correct the problem. You have a 5 star rating with us and we would recommend your product to others. Thank you for all of your help! Response from DR SupportThanks for leaving a review about your Power Grader. We are sorry to hear that it isn’t going deep enough for your needs. Maybe some extra weight in the tray would help? Your comments will be passed along to our Product Development department for review. Response from DR SupportThanks for leaving a review about your DR Power Grader. We are sorry to hear you are not fully satisfied with the purchase of it. If you would like to provide more information, please email us at info@drpower.com and we can pass the information on to Product Development for consideration. We are interested in what kind of soil you have. The product works well when used on the correct rock size and little grass mixed in. I have a mixed rock driveway, previous owner had mixed small graval rocks with crushed white rock of various size and in some areas tar is mixed into the gravel rock. Obviously the DR tool was not made for this. I plan to use various tools to remove the grass and break up the gravel rock. In areas where the gravel rock is relatively free of grass and the tar the DR tool works very well. My 60" DR Grader arrived with no problems and with anticipation before it arrived, I read web reviews and came across one concern that was not expressed in the DR literature. Yes, a lawn and garden tractor of 19 hp or greater can pull the grader but according to the blog I read, it should have rear attachment towing capability. That makes quite a difference in the use of the grater and the DR warranty is voided if towed with a pickup. I am happy with the results of the grater although I used it tentatively which didn't utilize its full potential because I had my tractor's transmission in mind. My tractor is a Craftman 24 hp Lawntractor. So I would suggest checking this issue out before purchasing the DR Grader. A word of warning, fully charge the battery before using the grader as recommended, I didn't and had to buy a new battery. I replaced mine with a heavy duty lawn tractor battery. Smoothed out very rough lane. Our lane is almost a 1/4 mile long. It had wash outs, pot holes, and a washboard. I waited until it rained an inch or more, Then I graded it. I ran over the lane 6 or 7 times and it turned out so good, I decided not to put more rock down. Grooming our horse arena is now a breeze with the DR Power Grader. This product does a great job for our application for a fraction of the cost of competitive equipment. Our arena is new and we want to keep it that way and the power grader does an excellent job of uniformly distributing the footing. It's really fast and easy, especially since we have the 60 inch model (well worth the difference in price). The drag screen is recommended for giving a sand arena that perfect finishing touch and works much better than the chain link drag I was using. After seeing the result on the arena we used the power grader on the old, heavily worn and hardened surface of the round pen. It looks like new also. The battery does not last very long extreme use. The drag screen cannot take softball size rocks as it bends easy. I like the product. This grader has a big WOW factor! I share a driveway with my neighbor and the total length is just under a half mile. In years past I'd drag a harrow over it with a bunch of tires (which were always falling off) for 6 hours just to get the gravel broken up and semi smooth. With the DR grader it took half that time and it was in the best condition since a contractor redid it 6 years ago. Within a week 5 friends borrowed the DR grader and were amazed with the results and the ease of using it. Two of those individuals are now considering getting one of their own. What does that tell you! When the power grader arrived, it worked like a dream...once. The next day I tried to use it and it was dead. Called customer service and they walked me through a number of things it could be, but as it turned out, the battery was discharged and couldn't recharge. Once we determined that was the problem, they shipped me a new battery (no charge!) and we've been grading up a storm ever since. Very pleased with this purchase. has a remote control.so u never have to get off the 4wheeler to make it work. This is very easy to put together.made our old rough rutty road like new.did not have to by a load of expenseive gravel.we just drug the old gravel upland filled in the ruts.we needed new shear pins.do I order them. The girl call back a little later said she dug around and found a better deal then the first order I placed.saved us over20.00 dollars and we gotmore pins then we would have gotten on the first order Great piece of machinary.Thank you dr power equipment. . I own a RV park. The grader is useless on well packed roads. The tines would not sink into the ground. Even with 70lbs. of weight on it. The only way I could get any use out of it is to drag it behind a box blade on my tractor. The box blade has much deeper tines to penetrate the ground. Then the grader does a decent job of smoothing out the loose gravel. I will probably be returning the grader. Response from DR SupportWow, you must have some dry, hard packed soil! We’re sorry that the Power Grader isn’t doing the job for you. Maybe you could moisten the road a little before trying to help loosen it? We appreciate you mentioning it & we will pass this info on to our engineering group. I have a 660ft gravel/rock/dirt driveway on 5 acres in Colorado. It was in rough shape when we moved in, ruts, groves and potholes. I decided to try the Dr Power Grader before having to buy a full sized tractor with box blade. I towed it behind my ATV. Setup was easy but after the first few times over the driveway I thought I had made a mistake and would need a full sized box blade. But, I had read other comments about it taking some time so I decided to give in an hour and a half of continuous up and down the driveway and I was amazed at the results little by little it took down the high spots and filled in the low spots and the results after only the first hour and a half were amazing for a piece of equipment as light and easy to use as this so my advice is to anyone who does not think it will work is give it some time let it work. We have about a 1/3 mile driveway which was full of potholes.Now we can actually drive in a straight line after using the grader.Worked behind our utility vehicle.It took about 5 passes and it looks like there was loads of gravel delivered afterwards. I live and work on a farm, all with gravel driveways. I maintain about 8 miles of spread out driveways and lots. I was very surprised at how well this little guy worked 60" model. It tore right into my driveway and immediatley started doing its job, and ill tell u what it did it very well indeed. I love this grader even on sand and dirt it works awesome, wish i would have bought one a long time ago. keep up the great work!! Proffesional quality for homeowner price! I will start by saying I initially skeptical at how well a light grader would work. i live on a privat road about 3/4 of a mile long. It is a gravel/clay mix that gets very hard packed from traffic. I went out on a limb thanks to the 6 month trial period figureing, what do I have to lose? It showed up well packed and was easy to assemble (took about 45 minutes). I started doing my own driveway first and within 3 passes the driveway was smooth and level. Then I moved to the hardpacked road. Without any additional weight it took 2-3 passes for the scarification teeth to loosen the top layer, once loosened the grader blade did a good job carrying loose dirt and depositing it in existing holes. I missed grading the next day due to rain, however the following day the grader worked even better due to the ground being softer, I would reccomend everyone try and grade after a rain as soon as puddles are empty. Overall iam extremely satisfied with this grader. Sorry old grader guy you cant count on our road for $ 1000 twice a year anymore! After using the power grader for 2 seasons, the only draw back that I have for my road is that I don't seem to get enough depth. I wish there was an option for possibly larger tires and 6" or so teeth, so that you can get into deeper holes and level them out with fewer passes. Great product and extremely useful for my long gravel driveway. I have on the DR Power grader for three years now and it has been exceptional in fixing my gravel driveway and the dirt road I live on. The first set of teeth on this grader are not even showing any signs of wearing out. I have been through two different batteries. Even keeping it charged after every use. And I use it so much that two of the welds have had to be fixed on the wheels that lift and lower the grader. I just drop it on my four wheeler tow Ball on the back and I'm off. We have owned this power grader for years and it was one of the best investments we made. We have a gravel driveway approximately 450 ft. long and each year we need new gravel and this does a great job leveling the gravel. Also my son-in-law uses it for his gravel drive. Several weeks ago two of our neighbors borrowed it after they saw what a great job it did. We have never had a problem with it. Couldn't believe this could do all they said! I watched the DVD & videos over & over & talked to DR repeatly about this product before I bought it. I couldn't see how it could work as well as does. Now that I've had it a couple of years, I can't believe how well it works! it works just like they say. After using one l'll always have a working one now, their perfect . This product has wonderful features and is one tough piece of equipment! I have been using my DR Grader for almost a year now. Before all I could do was drag the driveway with an old harrow. All the harrow did was move the surface material around a little bit. It did make it look a little better for a very short period of tiem. Using the DR Grader, I can dig into the surface a little bit at a time and truly level the driveway up. I have been able to get rid of the tire ruts that had formed over the last eight years. I have been able to level up the low spots and high spots so now when it rains, the rain actually runs off the driveway, instead of standing in low spots all over the place. I really like that I do not have to get off my ATV to adjust the height of the DR Grader. The remote control hydraulic ram that raises and lowers the unit is absolutely wonderful. I have a 1/2 mile driveway and it does a good job. Works great and easy to operate. Have owned our power grader almost 4years. Does a great job of maintaining our driveway and our horse arena. Remote makes the job really easy. Would recommend this product to anyone that has to maintain their own property. Right product for the right job. In the rough, hard-scrabble Texas Hill Country, all equipment needs to be extra tough. Will the DR Power Grader cut new roads through a rocky wilderness? Of course not! But for the dirt roads and gravel paths where the rocks are under 1" in size, this will smooth out the ruts and clean up wash damage with a better finish than anything I have ever tried. Easy to use. Control of depth is at your finger tip. Use it on a 1200' driveway and have great results. First time the drive has been smooth in years. Did my neighbors drive and she was very pleased to be able to not spill her coffee leaving for work. Mine is real old and when I needed a part for it the man on the phone was very knowledgeable and new exactly what i wanted just from the description I gave him. Nice tool and good service, what more could you ask for? Huge time and money saver! I have a driveway that is 1/3 mile long and this product has saved me from having to purchase gravel annually to fill in pot holes. Since I can drag it behind my tractor, I do not have to manually grade the driveway and after grading the driveway, the ride is smooth. I did have a weld brake on the unit but was able to have it fixed through a friend for free. My neighbor now uses my driveway instead of his own, since his is in need of grading! I have had this grader for several years. I have a half mile driveway and it is expensive to put gravel down. With this Dr power grader I can go years between adding new gravel. This product works better than my road blade alone that I used before I bought this product. I highly recommend this product. I find I need my kubota tractor to pull this unit on the driveway with hills. My polaris 700 would not pull it well, nor would a lawnmower work well. I added a full size car battery to my weight tray instead of having to replace the specialty battery every year. I have had my power grader for about 4 years now. Right after the initial warranty expired, I had to have the grader welded where it broke. Fortunately we had the means to weld it. Also the heavy duty plastic holder on the middle should be made out of metal as it is destroyed, just from placing some weight into it to help the grader stay on the ground and not bounce around so much and help it dig into the ground deeper. Overall though, the grader does an excellent job of breaking up the gravel on our very busy park roads. Response from DR SupportWe're sorry that you have had an issue with your Powergrader, but are glad that you posted about it!. We like to hear how our products are performing. We're glad that you were able to fix it and are able to keep your roads smooth! If you ever have any other issues or questions, please get a hold of tech Support @ 800-687-6575. Easy to use and it does the JOB RIGHT!!! I use it on our dirt road and it keeps the road smooth. I used it on the lawn of a newly constructed home and couldn't believe how smooth the lawn got so I could plant grass. It is a little light, but with repeated trips does a fair job in smoothing our our drive. I do still have some problems with washboard problems. Purchased about two years ago. Our rural road is about a 450 feet off of the main road. We have to maintain the road so a neighbor and I bought the DR 60" and the first time we used it behind my 27 HP garden tractor we were very happy at the results because it worked just like it showed in your web video. Our road is crushed lime stone and gets hard as cement so I wait until we have a rain before I grade. Have graded it around 20 times and can not see any wear on the teeth. Great products! This product turns a bad driveway into a great one in no time. My driveway is about 1800 feet long and winds back into the woods. Every other year I have to put about 25 tons of stones down, but I keep getting pot holes all over the place. I purchased the 60" grader and haven't had to get all that stone, I just go up and down the driveway about 3 times and it is pot hole free. I have a driveway 7/10ths of a mile and it keep my driveway nice and smooth. I use my 60" Power Grader every spring to repair my 600 foot driveway after the long snowy winters. I have used this a few times and it does not grade my property like it shows on the the dvd. My property is mostly gravel and it does not dig into the ground like it should, even with the extra weight in the bucket. I do not like the fact that I can not tell when the battery is plugged in or when it is fully charged. There is no indicator anywhere on the charger or battery. I would not buy this again. Response from DR SupportWe're sorry the performance of the Power Grader isn't what you expected. We do thank you for posting about it though! It may take a few passes to get the gravel loosened up. Perhaps you didn't take enough passes? Any 12 volt Charger with a 2 amp or less setting is fine to use on our Battery. I use my Power Grader to maintain a 100 yard gravel driveway and large parking area twice a year in the Spring and Fall. I can't imagine how I could do this job without it. I've tried both a box scraper and a landscape rake and neither can get the results I get with the Power Grader. Additionally, I don't see this thing ever wearing out. I'm sure it'll get passed down to the next generation eventually. We purchased this road grader a few years ago and it has done an amazing job keeping the gravl road into our neighborhood free of potholes. Before we made this purchase our road and driveway was a mess. Deep potholes, uneven distribution of the gravel. The first time using the road grader made it 100% better. Regular maintenance has made the road close to asphalt smooth. I would definitely recommend this product. The power grader fits our diverse driveway. I have used several different types of leveling blades and the power grader is the best that I have used. I use the grader with and without the teeth and it fits a diverse driveway. We have a 1/2 mile driveway that has flat surfaces and a steep hill. The grader helps me to smooth out the hills and keep the driveway compacted to prevent erosion. It also helps me on the flat surfaces to loosen the surface and smooth out the driveway. The 60" model saves me time with a 16 foot driveway where I only have to make 3-4 passes. It also helps me to redistribute the gravel after a winter of snow plowing. Easy to use. Does an excellent job on "Bin 10" road base. Q.The powered remote cord is only 5 feet long. How much is the extension? It isn't listed in "Other Items" on the Power Grader page. Q.I bought a lot that used to be pasture land. It is very bumpy. Will the 60" pro model work well with my zero turn (27 hp) to smooth the lawn. A.Thank you for your interest in the Power Grader. This unit will not work on ground that has established grass/sod. It is designed to be used on dirt, gravel, sawdust, and other material like that. With established grass/sod, it will pull and snag on the machine. Please feel free to give us a call if you have any other questions. Q.Can you use a pickup truck to pull the blade? I assume you would need the extension cable. A.Hello Toby, thank you for contacting us. 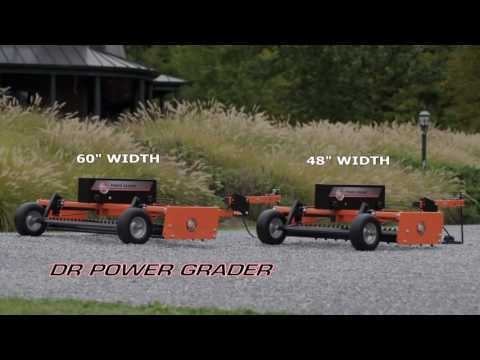 The DR Power Grader is not designed to be pulled behind a Truck or Car. You will not have a clear line of sight and it is hard to maintain the low speed needed to properly use this unit. Please feel free to contact us if you have any other questions. Q.I see that an ATV with a minimum 360cc is called for in the specs. I have a Honda Rancher 350 and live in the mountains with a pretty steep gravel drive. Is my ATV big enough to pull the power grader? A.Thank you for contacting us. You will not get the optimal performance out of the Power Grader if you're using a towing vehicle under the recommended size especially with the steep incline. Please feel free to contact us if you have any other questions.